When I was in the fourth grade, I remember sitting down on the carpet with the rest of my class while our teacher told us we were each unique and special, but not in the same way we had been told before. Mrs. Campbell went on to give us each a mini-quiz to determine what kind of learner we were, and for each project throughout the year, the “kinesthetic” learners would have a different assignment than the “logical/mathematical” learners and the “verbal/linguistic” learners would differ from those two and so on and so forth. There has since been much debate on Howard Gardner’s theories of Multiple Intelligences. While it is rare that one person learns in only one of these ways, some can be more dominant than others in an individual and, just how each teacher has varying methods of teaching best, each learner has a different way of learning. 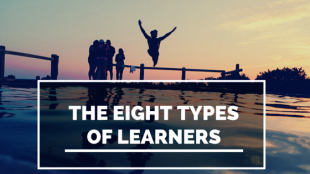 The following are eight theoretical “Types of Learners,” and what kind of elearning course might best suit them. Visual learners prefer using pictures, images, and spatial understanding to learn. Perhaps one of the most suited to elearning due to their proclivity towards visual media, this is generally the type of learning content creators for the web think about when designing content. Infographics, courses with imagery-saturated powerpoints, and videos are ideal for this type of learner. If there is information that can only be conveyed through text, visual learners might find it helpful to use color to highlight important information and links. Using different fonts also works well. A simple way to raise the stakes and increase tension during online courses for these learners is to create timed assessments at the end of every section. It mimics a real-world deadline and presents a challenge to learners who might be bored otherwise. This atmosphere can be created online through slow-paced engaging lectures and quizzes. Friendly voices, graphics, and courses that these learners can take at their own pace helps. These learners prefer memorizing and learning by copying down information, or emulating the artform they are trying to achieve. While elearning courses can be unfriendly to emulation, what comes to mind instantly is this series of tutorials by Canva. In it, learners can follow directions and mimic the left side of an infographic to gain graphic designing skills within their program. Features that allow users these type of capabilities greatly benefits copy learners. Instead of assessments where the viewer picks the correct question, have them write back material or create the ability to take notes within the course. If you are learn best by writing, bring a designated notebook and pen along to the computer with you at all times to write down information to make sure it sticks around long after you close the internet tab. Just like the oldest child in a family, trust learners respect authority figures the most and learn best from them. It follows that learning online would be most beneficial by listening to lectures by established entrepreneurs, or taking courses by respected members in the field they hope to gain experience in. They will learn best with a personal, human element present, instead of inline quizzes or audio narration over a powerpoint. It is perhaps the most difficult for kinesthetic learners to effectively retain knowledge through online learning (which is most likely the reason you don’t see too many elearning courses for shooting the perfect free throw). However, courses such as simulations would benefit these learners best, as the learner would still be manipulating events and experiencing cause and effect. Auditory-musical learners tend to absorb information the best when they hear spoken word, aural patterns, or music. If you learn best through your hearing, find elearning courses with lots of video narration. While you can’t always create a song to learn course material, listening to an audiobook or lecture presents different formats to gain knowledge. If you’re looking to take a course, consider what kind of a learner you are and tailoring your course around it. Whether searching to take or designing an elearning course, make sure to keep these different learners in mind! What kind of learner are you? Did we miss any types of learners? Still not buying this whole “Types of Learner” business? We’d love to hear your constructive comments below.